If you love Mexican food, then Cinco de Mayo is a perfect excuse to invite some friends over and make a tasty dinner at home. 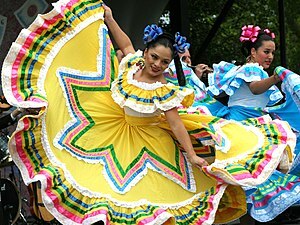 The holiday is celebrated with more enthusiasm by Mexicans living in the US than by their compatriots in Mexico. Contrary to popular belief, it has nothing to do with Mexican independence (that happened in 1810), but instead celebrates a huge Mexican victory over the French army in the Battle of Puebla, 36 years later. Outnumbered and outgunned, all odds were against the Mexicans, but they pulled off a spectacular victory, and now celebrate the date with all the pride it deserves. Because we are living in California this year, I want to make a special dinner with a truly authentic recipe that’s appropriate for Cinco de Mayo. Mexican cuisine is famous for moles : sauces that may be complex, time consuming to prepare, and a bit intimidating for the unfamiliar (such as myself). After a lot of research I settled on a recipe for chicken in peanut mole sauce, and made a “trial run” this past weekend. Tasty, tasty, tasty…. And, by the way, if you throw a Cinco de Mayo party, make sure to serve a batch of guacamole for starters. My husband’s recipe es muy deliciosa! Place the chicken pieces in a large pan or Dutch oven with water. Add celery, carrot, onion, parsley, bouillon granules, salt, and pepper. Bring to a boil, cover, and cook over very gentle heat for 2 hours or until the chicken is tender. Don’t let the water boil, make sure it stays at a constant simmer. Take the chicken pieces from the pan (remove the skin if you like) and season it lightly with salt. Place the pieces in a baking dish. Strain the broth; skim off fat. Reserve 1 + 1/2 cups of the broth for the sauce. Let it cool slightly before proceeding with the recipe. Make the mole sauce: in a blender or food processor place the reserved chicken broth, tomatoes with green chiles, bread, and peanut butter. Cover and blend until completely smooth. Place in a saucepan. With mortar and pestle (or in a spice grinder) crush cloves, peppercorns, and cinnamon well; add to saucepan along with chili powder and garlic. Bring to a boil. Reduce heat and simmer, uncovered, 15 to 20 minutes or until thickened, stirring often. Spoon the peanut mole sauce over the chicken pieces in casserole. Bake, covered, in 350-degree F. oven 30 to 40 minutes or till heated through. Remove the cover and run it under the broiler for a few minutes if you want a little more color. Serve the chicken over white rice. Comments: Don’t use a small, fryer-type chicken for this recipe, or you’ll end up with dry and tasteless meat. You need a stewing chicken, in all its plumpness, to stand up to the long cooking; at the same time it will give the broth an intense, deep flavor. You can freeze the leftover broth for use later, just remember it has a little salt already added to it. Even using the correct size of chicken, make sure the cooking liquid is kept at only a gentle simmer. I’d say this is the most important point to keep in mind when making this recipe. 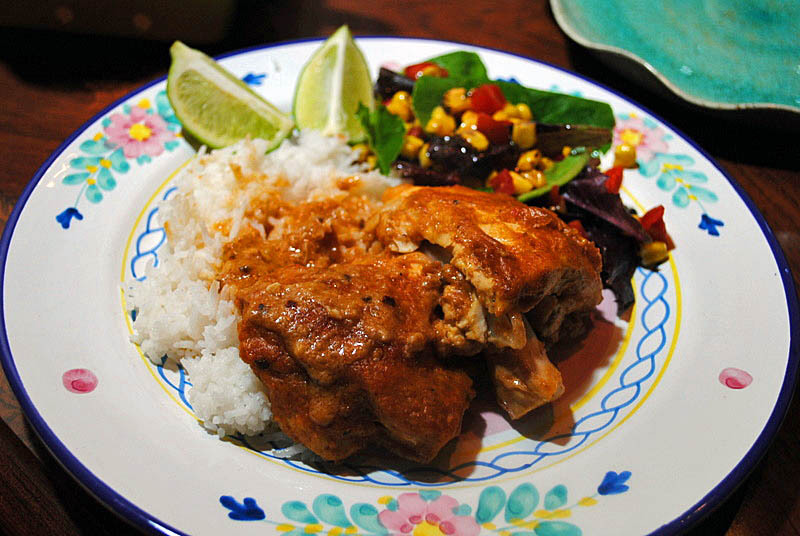 Now that you have dipped a toe into mole cooking, try a Diana Kennedy or Rick Bayless recipe. Their recipes will be far more complex and time-consuming, but the effort is worth it. The final complexity of flavors and balance will blow your mind! I do have one of Bayless books at home and can hardly wait to try a more elaborate mole once we move back. I miss my cookbooks so much! This looks delicious! I think it’s probably a bit too advanced for me to tackle with the kiddos next week…but we’re thinking along the same lines. Good authentic Mexican food. Mr. N is very excited! Will you be making this one again for Cinco de Mayo or on to a new mole recipe? This looks great! It has given me the motivation to do something special for Cinco de Mayo this year. Thanks you. That looks amazing. The only thing I’d do differently is use some of those leftover veggie parts to make a broth! I miss living in California. You just can’t get that food in the South. I’ll miss it when we leave…. I’ve always wanted to try something like this, but I have to get the peanuts past the husband, who likes eating straight peanuts, but won’t touch peanut butter… so will he like this or not? I know I would !